Espresso coffee machines are usually pretty robust pieces of equipment. Especially our La Spaziale espresso machines as they are built with quality parts and put together carefully. That said, you do need to look after them the best way possible. The biggest problem for espresso machines is the water quality. Water can cause scale and scale is the enemy! Scale on probes causes problems as an espresso coffee machine relies on them to feedback the right information. Scale on a water level probe inside a boiler for example can cause the machine to think that the boiler needs filling. The water level probe tells the machine how much water is inside the boiler. If the probe is covered in scale then it might signal to the machine that the boiler needs filling - this can cause the boiler to overfill causing water damage! It is therefore VITAL that you treat water before it enters the espresso machine. Normally you have a water softener connected to the espresso machine which softens the water. The water softener will help to prevent scale but it is worth mentioning that they are not 100% accurate. Scale can always build up slowly over time so it is therefore really important that you have the machine serviced at regular intervals. We recommend to service your espresso machine at least every six months. It is good practise to call out your local engineer to ensure the machine is working correctly. Your engineer can then check the efficiency of the water softener and advise whether you need to replace the current softener. How often do I have to service and/or replace my water softener? How often you have to service your machine and replace your water softener does depend a lot on the usage and on the hardness of the water in your area. Some areas have very good and soft water, others have very hard water causing lots of scale. Normally we would recommend at least every six months. It also depends very much on how you work your espresso machine. The worst thing you could do is to draw lots of hot water from your espresso machine all the time. The more water you run through the softener the quicker it will need replacing. Should I leave my espresso machine on or off overnight? 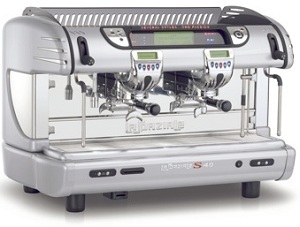 We would recommend to turn it off unless the machine has an overfill protection such as the La Spaziale S40 Seletron. If the machine is left on overnight and the water level probe for some reason tells the machine to fill then it could in theory overfill your boiler. So to be safe, it is a good idea to turn off the machine. Some people even isolate the water to the machine overnight. How often does it need cleaning? You need to back-flush your espresso machine every night. Please note that lever espresso machines do not need back-flushing. Back-flushing is done to clean the shower plates, the shower block and the solenoid valves in the groups. It clears out any coffee oils and coffee residue. If you have a dripping group head then this often the cause of a dirty group or a damaged solenoid valve (it could be something else as well). Yes, buy a hot water boiler! Hot water boilers should be used for teas and for Americanos. Espresso machines should be used to make delicious espressos and to steam milk. Use the hot water tap from the espresso machine as little as possible.